Donna Power from Experience Wellbeing is a specialist provider of Brisbane school retreats, reflection days and workshops for prep to Year 12 for both Catholic and State schools. She travels across and beyond Brisbane to connect with and empower young people along their journey. 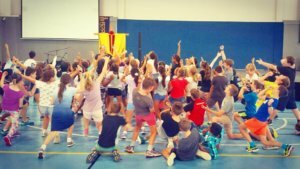 Experience Wellbeing retreats and workshops are about providing social, emotional and spiritual education for students in both primary and secondary Catholic Education and Education Queensland Schools. Preps to Year 12s are immersed in a number of learning styles and sensory experiences through various combinations of challenging games, live music, video animations, thought-provoking activities and discussions, quiet reflection and special liturgies. Students respond to Donna’s genuine nature as she leads them in a confident, calm and cooperative way often with a splash of humour. School staff value her consultative style as she integrates particular messaging from their pastoral care approach, the needs of the students and the context of the school’s culture into her planning. The structure and scaffolding for each program is tailored to ensure students feel engaged, affirmed and empowered. Donna creates original materials for her programs including colourful activities resources, animations and music, personalised name tags and meaningful symbols. 10 years as Campus Minister at Siena Catholic College; Primary School Teacher at Education Qld since 2012; Professional Singer/Musician since 2008 and Founder of the Project Kindy registered charity since 2011. “In the Australian Curriculum, students develop personal and social capability as they learn to understand themselves and others, and manage their relationships, lives, work and learning more effectively. The capability involves students in a range of practices including recognising and regulating emotions, developing empathy for and understanding of others, establishing positive relationships, making responsible decisions, working effectively in teams and handling challenging situationsconstructively.